With PlayStation 3 sales slowly decreasing year over year, Sony appears to be preparing key developers for their next generation PlayStation console. A new report published on VG247 names the CPU / GPU combination, RAM and hard disk storage of the illusive next-generation console which you can read in detail after the jump. VG247 cites “multiple sources” who claim that a newer version of Sony’s game development kit – codenamed “Orbis” – for the PlayStation 4 are being shipped to select developers, housed in what is described as a “normal PC case”. These units are the second version of the game development kit which include an accelerated processing unit (APU) based on the current “AMD Fusion”* A10 chipsets available in the market. Two more versions of the development kit are expected. The next kit will be sent out in January while the final kit will be delivered next summer. Now, there some serious advantages and a considerable disadvantage with choosing AMD’s chip instead of a newer “Cell” processor that was Sony developed for the PS3. Because AMD’s A10 chips are already being used on PCs, developing cross-platform games for the PlayStation 4 will become a faster, more fruitful process. The cost of manufacturing the PlayStation 4 will also be reduced since the A10 is a mid range chip that is already being mass produced (unlike the PS3’s Cell chip that was custom-made). As a result, cross-platform games will look better and buying the console won’t burn away all your savings. But one big disadvantage of going with the A10 would be that the PS4 will not be able to run PS3 games. 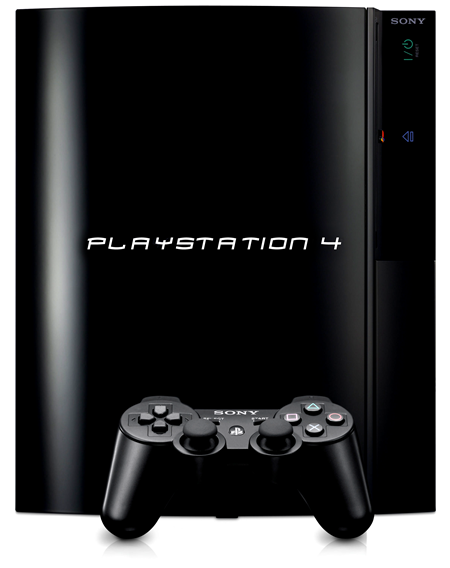 Like with certain models of the PS3, this will tick off a lot of gamers in the first two years of the console’s launch. Other specifications for the development kits claimed by VG247’s source include 8GB to 16GB of RAM, 256GB of hard drive storage and a Blu-ray disc drive. These specifications match current mid-range gaming PCs which isn’t unexpected; this is just how console hardware has been vis-à-vis PC hardware for the last two generations. It also being rumored that the PlayStation 4 will be the first console in the market to support the new monstrous 4K screen resolution. But, also keep in mind that a TV supporting that display at the present moment carries a price tag of a small car. Sony is expected to announce the PS4 at next year’s E3 conference in June at a “very affordable” price. *AMD Fusion processors combine the CPU and GPU on a single die for performance that just isn’t possible with comparable systems that have CPU and GPU on separate dies.